Tassimo Professional Discs for the Tassimo Pro machine. Delicious coffee has the ability to satisfy the most discriminating pallet. These coffees stand up very well on their own, or combine them using our Tassimo Pro menu system for even more fun creations! 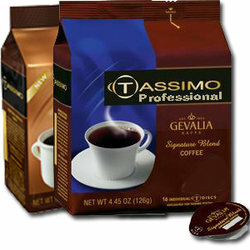 Incredible Coffee, Tea, Espresso, Cappuccino and more! Delivery in Metro Atlanta, GA only. Due to contractual distribution, our Tassimo Pro products are restricted to customers in Metro Atlanta, GA. Orders placed outside of Georgia will be not be filled.